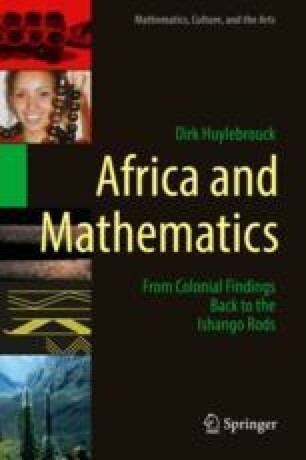 As the Ishango rods seem to have at least some connection to counting – be it phases of the moon or arithmetic games or whatever it might have been – the third chapter studies the African creativity in counting systems. For instance, “six” is sometimes expressed as ‘three-three” and “eight” as “four-four” and thus one could expect that etches on tally sticks, such as the Ishango rods, would be done in equal groups of tallies. Other African people say “five-twelve” instead of “seven-teen” because they use the base 12 and not 10 and they count this base with the thumb on the 12 phalanxes of the four remaining fingers of the same hand. Thus, the sums 48 = 4 × 12 and 60 = 5 × 12 seen on one of the Ishango rods could have been a result of such a counting system ‘by dozens’.